Labels peel easily from the backing sheet. 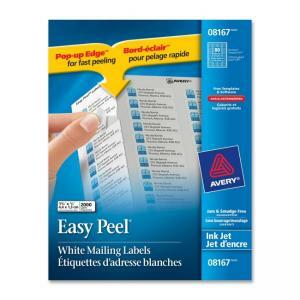 Easy Peel feature allows you to grab the edge of the label, peel and apply. Perforated 8-1/2" x 11" sheets tear so the edge of each self-adhesive label hangs over the sheet backing for easy access. Perfect for creating professional-looking mailings, shipping, bar coding and organizing. Avery offers many easy-to-use templates for Microsoft Word and other popular software programmes.